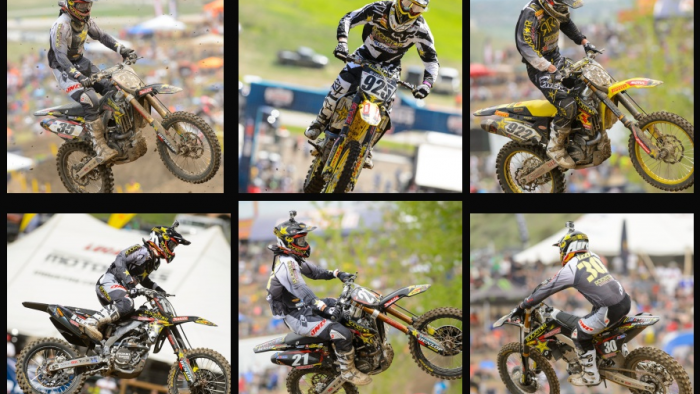 Round 2 of the Lucas Oil Pro Motocross Championship headed into the mountains of Lakewood, CO. The track sits over a mile above sea level causing severe power loss to bikes and an added variable to the stamina of the riders. High elevation cause cause dizziness, headaches, nausea and shortness of breath which are all unwelcome symptoms to athletes already competing in one of the toughest sports physically in the world. This however is something that every rider on the track has to deal with although some more than others. Thunder Valley also marked the first of two rounds that Rockstar Energy Suzuki World MX1 riders Clement Desalle and Kevin Strijbos will be competing in, before heading back to the GP series where they currently sit 3rd and 4th respectively in championship points. The format in US motocross is much different than the duo is accustomed to. So not only were they dealing with elevation, but also a completely unfamiliar composition. GP's are set over a course of two days as opposed to one in the US. They have practice on Saturdays and then a full qualifying race. Then on Sunday they race their main events which are actually 35 minutes plus two laps. In the US all of the practice, qualifying and racing is in one day. It is a big difference to have to set a fast lap in practice for a qualifying gate pick. Sprint speed is vastly different in lap time from that in the actual moto and typically takes a while to adapt to. The motos are also shorter, being 30 minutes plus two laps. Ryan Sipes did not have a weekend as successful as the opening round in California. His starts were not as good and he suffered from a pretty scary crash over the tracks huge step-up quad jump. Two things however remained the same. He has a bit of a loss of concentration in the middle of the motos, but is very strong at the end. His ability to charge through the last lap is certainly a testament to his training program with Randy Lawrence, and his work ethic. Ryan's fitness is incredible. Take away the small mistakes and fix the middle of the motos and Sipes will be fighting for the top 5. Ryan Sipes: "Colorado wasn't as good as I'd hoped it would be. In the first moto I kind of got a bad start and then jumped off the track. Tried to grind the side of the jump, went down and just never could get back going. The second moto I felt ok, I actually had a good start but I kind of spun out in the first turn. It was just tough back there and the first couple of laps I got separated from some dudes and it just never panned out for me, I couldn't find the flow. I finished strong and I'm looking forward to next weekend. It's probably as much of a home race as you can get. I grew up racing the mega series down at Muddy creek since I was on 50's. I know the track is gonna be completely different but it should be fun." Blake Wharton is improving every moto. His breathing is improving as his septum heals, which in turn is improving his stamina, which will lead to more speed. He is getting back to form one step at a time and has something to build on after every time he crosses the finish line. He finished a solid 8th in the 2nd moto which is certainly a step in the right direction. Blake Wharton: "Colorado, the track was a little different this year. It was a little more sandy. It still got rutted but it didn't rut up as much. Definitely just need to continue to try and workout my issues, my nose is healing a little more each week. Just been practicing. Got some decent starts today. The second moto I was able to ride a lot better. I'm looking forward to racing next weekend. We've never raced a national there but I grew up racing on that track. Muddy Creek is kind of well known so that will be cool." Overall Jason Anderson had one good finish and one bad finish. However he rode well in both motos. Anderson is also one of those riders that is affected immensely by altitude. In the first moto he improved his placement rounding the first turn for his best start of the season thus far en route to a 5th place finish. In the second moto, he crossed the finish line on the first lap several seconds in last place. That puts a lot of guys in front of him to pick up any points at all and salvage the moto. Jason was simply on the gas. He managed to work his way around enough riders to complete the moto in 12th place. A stellar charge through the pack. Jason just needs to put two motos together and he will find himself on or near the podium immediately. Jason Anderson: "This weekend was pretty good, well kinda good. Half good. The first race I ended up 5th which was a decent 5th, I feel like I should have ended up 4th. The second moto I took a digger in the first corner and came back to 4th. So I think I secured the RC Hard Charger Award. That's about the end of my day." Nico Izzi made a vast improvement from week 1 to week 2. He is unquestionably not finishing where his talent and drive will take him in the near future though. It doesn't take a motocross genius to know that it would take Nico three or four rounds to get it back. On the other hand, with the progress Izzi made in just one round it may come sooner than expected. Nico Izzi: "The first moto was good man, I had a good start. I was top ten for at least the first few laps but I lost my rear brake on the 4th lap. Then it was just survival mode. The track was really rough and I couldn’t charge down the hills like I had to. So I just tried to stay where I could and salvage some points, so I was pumped I got 11th. Stoked for the second moto, I was pumped to go out there and rip it up, then the same thing happened again. They lasted a little longer, til about the 6th lap. So I was just basically trying to get by this weekend and salvage whatever I could." Clement Desalle has actually raced at Thunder Valley one other time for the Motocross of Nations where he did really well. The format for that annual race however is the same as a normal weekend at a GP race. Desalle was still able to open a lot of eyes in 450 practice one qualifying 2nd and joining only Ryan Villopoto in the 1:53 lap time range. Clement had a successful first moto finishing 5th. He was clearly faster than 5th but not quite enough to be able to move forward in the pack. In the second moto he was not able to better that position but finished the day with a 6th overall. With the travel schedule and very little time to adapt it was a very good day for Desalle. Clement Desalle: "The morning was good, it was positive. The first practice I was second. I'm not used to the motocross style here where everything is in one day and really quick. Two laps free then you have to make the best lap possible. So that was quite good. The first moto I started in 4th then I made a small mistake and [Trey] Canard passed me. I was faster than him but I could never pass him back and I finished 5th. In the second moto my start was not so good. I was 6th and then I finished 7th. I'm not used to high altitude. Its not an excuse but it was a long trip and really busy last week, so it's not too bad." Kevin Strijbos had a bit more to overcome on Saturday than his teammate including a first turn crash putting him all the way in the back at the beginning of moto 1. Strijbos put his head down and assembled an amazing ride coming all the way back to 10th. Kevin has never competed in an AMA National, or even lined up for any race in the United States so that is incredible. In his second moto he was able to improve on that finish with an 8th for 9th overall, giving him a top ten in his first try. After racing all the way in Brazil one week ago, traveling to the California, having very little time to test, traveling to Colorado, then just jumping into a very foreign experience, both riders had a marvelous day. Kevin Strijbos: "I think overall it was a fairly good day for my first national especially with the elevation here which was pretty tough. It's so different in practice how you go two laps slow and then you have to be on it. It was kind of strange. In the first race I think I had a good start then I crashed in the first corner. Then I was charging and I came back to 10th from 38th so I was really happy with that. I was really kind of tired. Then in the second race, again I got a good start. I went kind of wide in the first corner to be sure that nothing happened and I could make it safe into the first lap. Then I was trying to push but I felt really quick that I already didn't have the power from the first race and I was already a little bit tired. So I just slowed down a little bit so I could keep a good pace the whole race. In the end I was 8th so overall I'm happy. I think this is the most tired I've been in the last 6,7 or 8 years so I'm dead but I'm really happy with this. We can build on this and try to make it better and be ready for the next round." The series moves to a track that has never had a Pro National next week. It is a track that has held Loretta Lynn's Amateur National Championship Qualifiers for years however, so some top riders have raced there before. With Muddy Creek never having a National though, it sort of equalizes the field, taking a bit of the disadvantage away from Desalle and Strijbos who will aim to improve on their Colorado performances. Sipes, who raced on this track much of his life as an amateur will look to ride more like he did in round 1. Anderson will try to put both motos together and get closer to an overall podium finish. Wharton and Izzi will continue to build on their improvements and mover closer to where they belong.